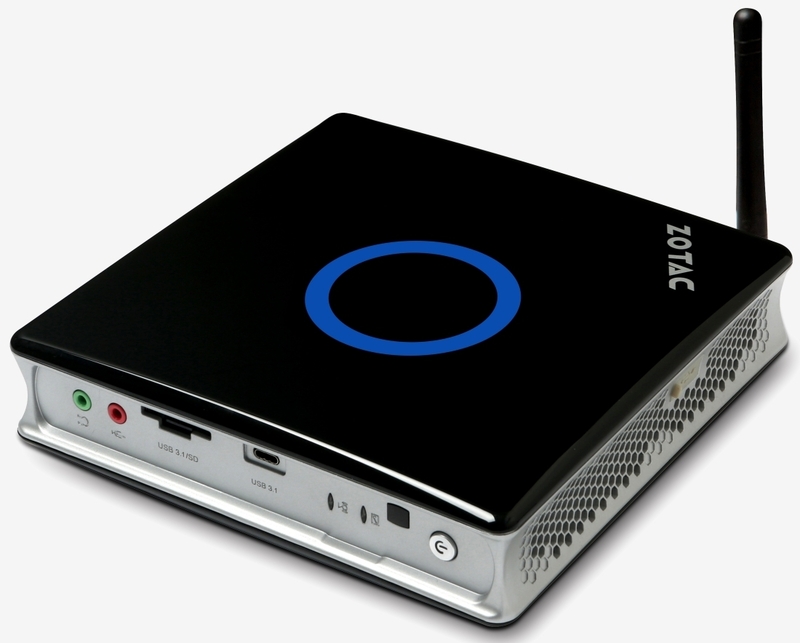 If you're looking for a powerful desktop PC with a tiny footprint, Zotac may have your answer. The company's latest mini PC - the Zbox MI551 - is equipped with Intel's sixth-generation Skylake processor and enough options to serve as an excellent HTPC or even a desktop replacement (if you aren't into gaming). The Zbox MI551 features an Intel Core i5-6400T processor, a quad-core part clocked at 2.2GHz (up to 2.8GHz Turbo) with Intel HD Graphics 530. There are two DDR3 slots that'll accept a maximum of 16GB of RAM, a single 2.5-inch expansion slot and a single M.2 SATA solid state drive slot as well as a 3-in-1 card reader, a USB 3.1 Type-C port, a headphone jack and a microphone jack. On the opposite side of the machine, you'll find two USB 3.0 ports, two Ethernet jacks, two DisplayPort connections and an HDMI connection. There's also a single USB 2.0 port on top of the mini PC as well as 802.11ac Wi-Fi and Bluetooth 4.0 connectivity. Zotac no doubt has a solid machine on its hands, especially when equipped with plenty of RAM and speedy flash storage. Unfortunately, we don't yet know how much it'll cost or when it'll go on sale - details of which I suspect we'll hear more about at next month's Consumer Electronics Show.